Escape to the lush tropical beauty of the Caribbean with the luxury units at Marriott Frenchman's Cove. Find timeshare resales and rentals today at prices up to 70% off. Positioned just off the sparkling blue waters of Pacquereau Bay, Marriott's Frenchman's Cove brings a total Caribbean experience right to you. From the Caribbean-inspired architecture to the subtle nuances and well-kept grounds lush with tropical life, you'll know you've arrived at vacation the second you check in. With fun-filled amenities like the infinity pool and expert services including free WiFi and free parking, you simply cannot go wrong with the luxury timeshare units at the Marriott Frenchman's Cove. Perfect for anyone looking for a warm beach getaway in St. Thomas, the units at the resort include two and three bedroom villas. Ideal for families or large groups of up to 12 people, the villas come furnished with modern in-unit accommodations and upscale amenities. You can prepare your own meals in the full kitchen and enjoy dinner overlooking the water on your private balcony. With up-to-date entertainment systems and premium bedding, everyone in your group will be guaranteed the peace and comfort a vacation should bring. Are you ready to lock down these gorgeous St. Thomas accommodations? There are timeshare resale and rental advertisements available at the resort now. 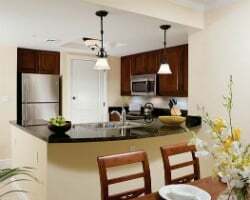 Fill out the form on this page to learn more about the timeshare units at Marriott's Frenchman's Cove, or call a representative at 1-877-815-4227. Buying a Frenchman's Cove resale can open up a whole new world of vacationing you never thought possible. Not only will you be the owner of a Marriott St. Thomas timeshare, but you'll be able to obtain your very own slice of paradise for much less than others pay. Timeshare resales are provided by current timeshare owners, not the resort. This means that prices for timeshares are much lower, often to the tune of 70% below retail. This gives you the chance to acquire the same amazing ownership accommodations, and save thousands of dollars. Typically available in the form of deeded or floating Marriott weeks, timeshare resales at the Frenchman's Cove resort are spread throughout the calendar year. You'll be able to easily find a price point that fits your budget, and an ownership interval that matches your vacation preferences. What's more, timeshares at the resort fall within Marriott's Silver, Gold, Platinum, and Platinum Plus seasons. The Frenchman's Cove resort is affiliated with Marriott Vacations Club, one of the most resale-friendly timeshare brands in the industry. You'll be able to reserve accommodations using your resale week at the resort immediately, but you may choose to upgrade your timeshare ownership into the Marriott Vacation Club Destinations program. Doing so would give you yearly Marriott points instead of a regular week, and could also enable you to exchange accommodations internally at other Marriott resorts. 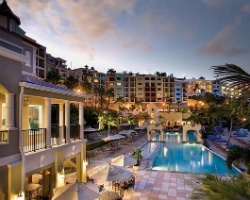 Marriott's Frenchman's Cove is also affiliated with Interval International, a leading timeshare exchange company. Timeshare exchange provides a way to maximize the use of your timeshare resale and can enable you to discover new destinations. If you pair your Frenchman's Cove resale with an Interval membership, you can deposit your accommodations in St. Thomas and exchange for stays at other resorts all around the globe. Additionally, the Marriott Frenchman's Cove holds an Elite Resort rating from Interval, the highest award possible for affiliated resorts, recognizing its superior amenities, services, and guest reviews. 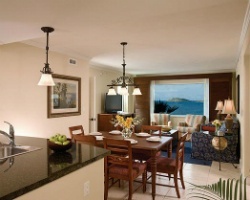 This Marriott Vacation Club St. Thomas resort truly embraces the atmosphere and excitement of the Caribbean. 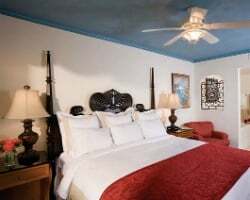 You'll find the property is full of wonderful on-site amenities and services to make your Virgin Islands vacation perfect from top to bottom. You'll find the infinity pool, water slide, and whirlpool tub to provide unbeatable vistas of the resort's natural surroundings, and the perfect spot to relax. Speaking of relaxation, it doesn't get any better than the Lazule par la Mer spa located right on the resort's grounds. Don't forget to also check out the resort's on-site restaurant, the Sunset Cove Poolside Bar & Grill for cold cocktails and authentic Caribbean cuisine. Being located right on Pacquereau Bay in St. Thomas, the Frenchman's Cove is close to some of the island's best attractions. All the watersports your heart desires are available nearby, with snorkel equipment rentals and chartered sailing excursions ready for you. Explore some of the island's historical attractions like Bluebeard's Castle, or head to Coral World Ocean Park for family-friendly fun. Already Own at Marriott’s Frenchman's Cove?